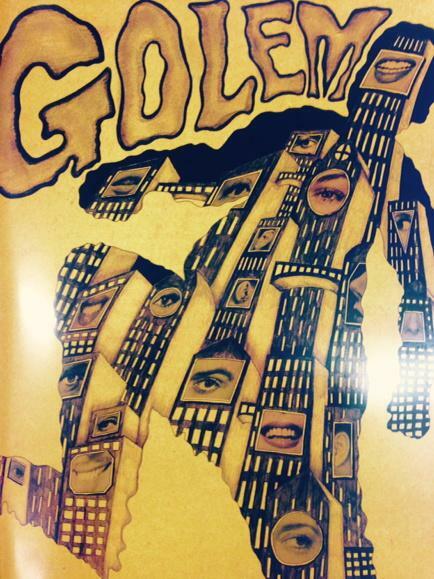 Visually stunning and mentally provocative – Golem is Metropolis on acid. A glorious, heady mix of live music, animation and actors, the play explores our relationship with technology and our increasing reliance upon it. Set in a fictional yet recognisable universe, the play uses the myth of the Golem as its base – the story of a man who makes a creature out of clay to work for him. The Golem in this play represents technology and the market economy. The clay man is originally created to serve yet very quickly he is the one in control of his owner. The market relentlessly pushes the consumers on – bigger, better faster, more! Golem is replaced by the newer, faster Golem 2 and the clunky obsolete original Golems now litter the street – out of date and unwanted.